Charles Strite got tired of burnt toast and invented the clockworks style automated toast control. Mr. Waters and Mr. Genter obtained the patent and this toaster is one of the results. McGraw Electric / Waters Genter Div. used the "Toastmaster" logo on this unit but this is the same company and this is one of the first automatic toasters made for home use. They had this single slice version and a double version. 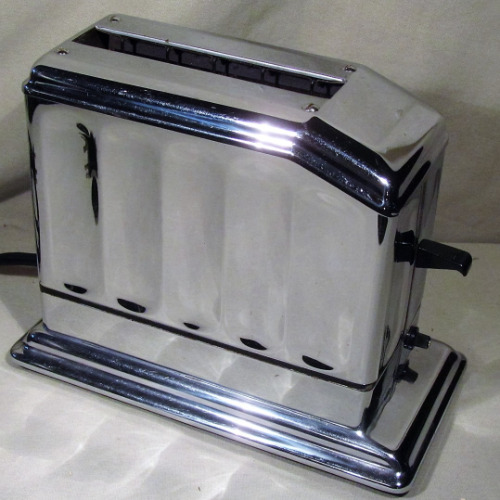 This extremely stylish toaster has been completely refurbished, cleaned, new wiring, connections and clockworks fixed. It works like a charm and has light -dark selector knob. The faceted sides just radiate light and it looks fantastic. Very heavy duty chromed metal. You can tilt the unit to slide the crumbs out or remove it with easy thumbscrews to undo the tray and clean out the crumbs. This toaster can be used daily. The McGraw Electric Company introduced this model 1A2 in 1932. It was made by the Waters-Genter Div. in Minneapolis. 600 Watts, 6 foot new cord. Its fun to hear the "tick, tick, tick" of the clockworks and watch the push handle rise; then all of a sudden "pop" and the toast is done! You control the light to dark and it is a nice wide range on the dial. Please note: It is not for bagels. I guess they didn't toast them back then; the slots are skinny so its bread only or anything that will fit. Waffles would work. Also note: This one will only adjust to "light" with a brown shade, no tan. Its adjusted as far as it can go, the clock works is just a little slower than normal. Still excellent toast.